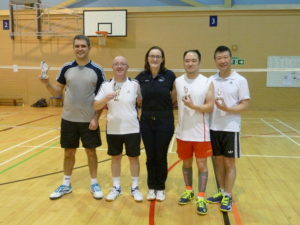 Adult Social Badminton Tournament – Huge Success! 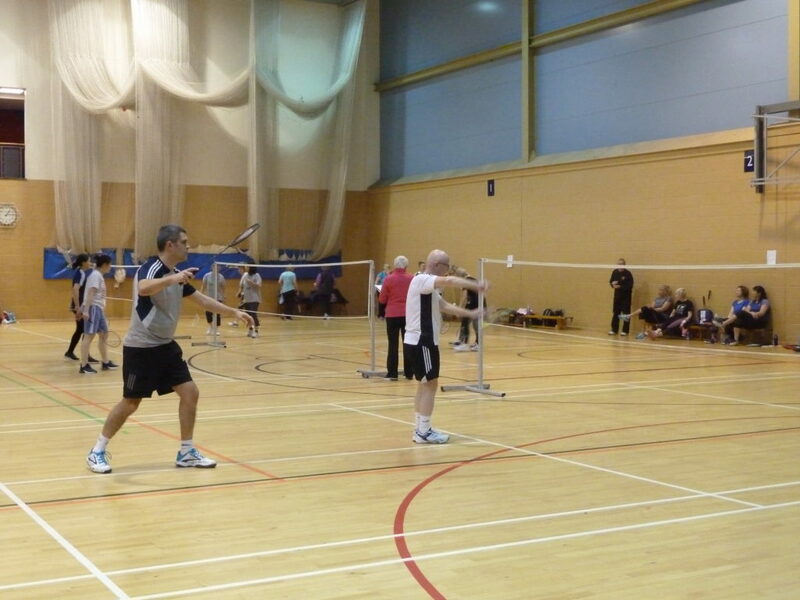 The latest North Tyneside Social Badminton Tournament, held at Hadrian Leisure Centre in Wallsend, was another hugely successful event, attracting 56 players from all over the region, with an age range of 14 to 74! As well as many familiar faces taking part, it was very pleasing to see a good number of new players! As usual with these social tournaments, the aim was to cater for the casual, social players who enjoy some friendly competition and playing against different people. 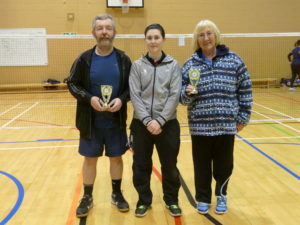 Regular competitor Mark Henderson, who just loves playing badminton and competing in these tournaments, ended up a double champion, winning both the Men’s and Mixed Doubles events. Mark and his Men’s Doubles partner Kevin Mann actually finished runners-up in their group, losing to Alan Lam and Jon Mao. Then both of these pairs went on to win their semi-finals, meeting again in the final, where this time Mark and Kevin came out on top, winning easily 21-5. 15 pairs took part in the Men’s Doubles, playing initially in 2 groups. 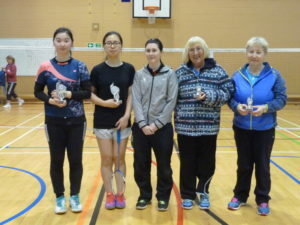 New players Yum Yum Guo and Monica Zhon played extremely well throughout their Ladies Doubles group matches, which featured a record 10 pairs, defeating the older and more experienced Jo Donaldson and Lillian Allison 21-14 in a very good final. Joyce Buchan, the oldest competitor at 74 years of age, teamed up with Mark Henderson to win the Mixed Doubles, with initially 22 pairs playing in 4 groups. They overcame much younger Chinese players Alan Lam and Oliver Mao 21-10 in the final, demonstrating how age and experience can triumph over youth! Badminton is a great sport for all ages and abilities, from Primary age children up to OAPs! Anyone who would like to know more about opportunities to play socially, casually or in an affiliated club, can contact the County Secretary by emailing normawfd@blueyonder.co.uk. To find out what sessions are happening in North Tyneside for adults and juniors visit the Sport North Tyneside website by clicking here.